The most common energy sources – fossil fuels, coal, oil, and natural gas – are nonrenewable. That means they will all be gone one day, and, at the rate we use them, one day soon. However, before that day comes, these sources of energy will become too expensive and too environmentally damaging to even want to use them. And the truth is that we can stop this from happening. There are many minor adjustments you can make around your home to conserve energy, save money, improve the environment, and enhances your quality of life. So why not invest the little amount of time and effort now to invest in our world’s future. One energy-saving product that many people don’t think about installing is the attic fan. This will save you money and energy through lower home cooling costs. 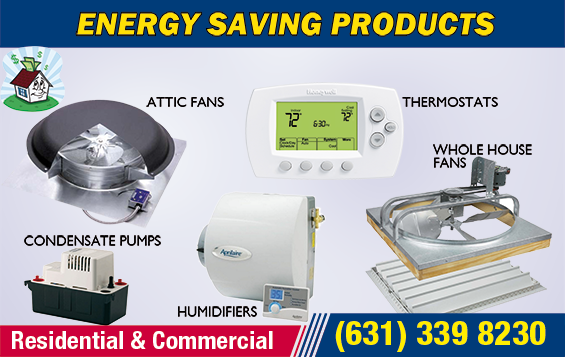 When coupled with the correct ventilation system, attic fans are designed to blow out the hot air that rises into it, thus keeping the cool air below it circulating within the home. Whole house fans are also great energy savers for when nights are cool and days are hot. They ventilate the house by pulling in air from outside and exhausting it through the attic and roof. When used wisely, whole house fans can substitute for an air conditioning system during a substantial part of the year. Another energy-saving product that people do not utilize enough is the programmable thermostat. This can help with heating and cooling costs, simply by setting the digital thermostat accordingly. For example, in the wintertime you can program it to be a little cooler at night and when you’re not at home. This can help save the planet without you having to think about it or having to feel discomfort from the cold. Humidifiers are also a sometimes overlooked energy-saving product. Think about how a humid day makes it feel much hotter and stickier. This is because moisture in the air increases the heat index. That means it feels a lot warmer than it really is. Using a humidifier can help you set your thermostat down a few degrees. Even just putting it down one degree can save you from two to four percent on heating costs for the season. So think about using a humidifier in the winter, and you won’t just comfortably set your heater a bit lower, you will also combat against the dryness that comes along with winter. A condensate pump can also lower energy costs. This is a pump that drains the water out of heating and cooling systems. In the first place, the waste is routed to a sewer, so the liquid is eliminated in the most environmentally way possible. Also, the pump keeps the heating and cooling system working efficiently by freeing up the lines so that no water freezes up. It also filters out dust, microbes, and other contaminates. There are so many small changes that we can all make to help be more energy efficient. All we have to really do is invest the time and money in order to save time and money later on. There really is no reason why homeowners shouldn’t take advantage of these devices so that their home, wallet, and world can be a little healthier.